Introducing Semplice 4: Packed with New Features that you will love - Dr Wong - Emporium of Tings. Web Magazine. Semplice is a product that I personally love and use for my own online portfolio. For those who don’t know what Semplice is, well it’s simply a customizable CMS on your WordPress Platform. It’s very intuitive to use and they have recently launched with Semplice 4. It’s packed with awesome features. Like I mentioned before, it’s far away from being your typical template. It’s actually a portfolio system, let’s take a closer look! Semplice helps creative professionals show their work in the best way possible. Semplice is not a template but a powerful system. It’s a flexible tool that helps you create a portfolio that stands out. It’s for creatives who want something better than a standard template. Semplice believes in the power of the WordPress community and they believe in open source. That’s why Semplice is built on WordPress and completely self-hosted. You fully own the code and files, you have complete freedom. Semplice recently released Semplice 4 with all new features. They redesigned and redeveloped Semplice from scratch, making the portfolio tool more powerful than ever. 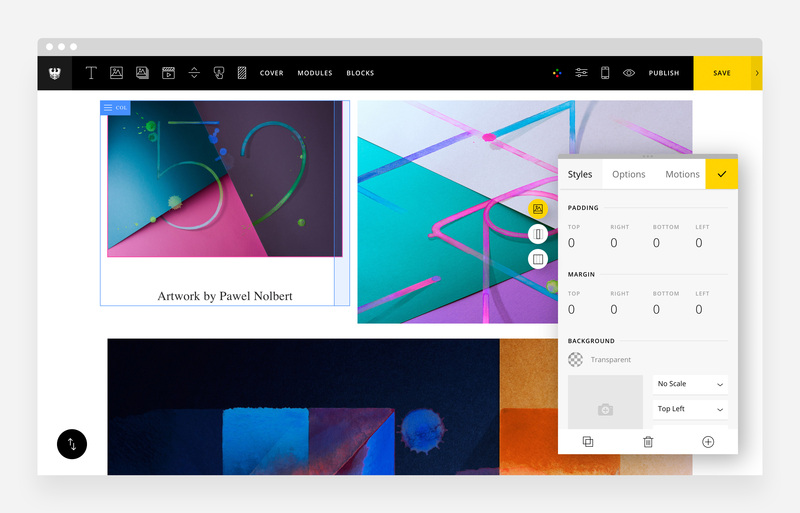 The redesigned Semplice 4 content editor is clean and elegant, allowing you to create layouts with simple drag and drop design. Add animation and motion to your portfolio elements, create your own custom grids and navigations, add background video, page transitions, scroll effects, and a whole lot more. Check out Semplice 4. Semplice’s goal is to give designers a tool they can fully hack and customize, even if you don’t know how to code. However, if you do know how to code you can take Semplice even further with a little bit of custom HTML, CSS and small tricks. Learn more about Semplice for developers.